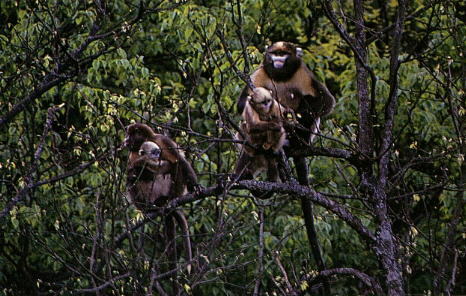 The few Guizhou snub-nosed monkeys measured to date have weighed about 8 kg (18 lb) (1 female) and 15 kg (32 lb) (two males). This monkey lives in steep mountainous areas in a zone of mixed deciduous and evergreen broadleaf forest between 1500 and 2200 m (4900 - 7200'). Temperatures fall below freezing during 5 months of the year, and snow is common in winter. (Ren et al. 1997) The Guizhou snub-nosed monkey uses a wide variety of food resources. Preferred foods include young leaves and leaf buds of many species of broad-leaved trees. The Guizhou snub-nosed monkey is primarily arboreal, although it frequently crosses open areas on the ground. Its social organization appears to be based on small groups of 3 - 10 individuals, each with a single male. These groups congregate in larger, semi-cohesive groups of up to 400 individuals. The Guizhou snub-nosed monkey has only been known from a small area in Guizhou Province, China. In the 1930's, it was included among the Chinese fauna in danger of extinction. Currently, the Guizhou snub-nosed monkey occurs only in a small region centering on Mt. Fanjing in the Wuling Mountains of China. Hunting of the Guizhou snub-nosed monkey, especially for its fur, had already made it rare by the 1960's. Hunting (mostly for food and for use in Oriental medicine) remains a problem. However, habitat loss is the most serious threat, especially the cutting of trees by local residents for firewood and for building homes, as well as deforestation by government-owned logging companies. *** The three Chinese snub-nosed monkeys (Guizhou snub-nosed monkey, Rhinopithecus brelichi; Yunnan snub-nosed monkey, R. bieti; and golden snub-nosed monkey, R. roxellana) used to be considered as subspecies (Rhinopithecus roxellana brelichi, R. r. bieti, and R. r. roxellana, respectively) of the snub-nosed monkey, Rhinopithecus roxellana. *** The fur of snub-nosed monkeys was greatly esteemed by the Chinese and formerly could only be worn by Manchu officials (IUCN 1970) . 2004: Occurs in China (IUCN 2004). Currently, the Guizhou snub-nosed monkey occurs only in a small region centering on Mt. Fanjing (Fanjing Shan) (108 deg 50' E, 27 deg 57' N) in the Wuling Mountains of China, with the monkeys mostly restricted to the 275 sq km (106 sq mi) core area of the Fanjing Shan Nature Reserve (Ren et al. 1997, IUCN 2000) . Hunting of the Guizhou snub-nosed monkey, especially for its fur, had already made it rare by the 1960's. Hunting (mostly for food and use in Oriental medicine) is still a problem, but the most serious threat is continued habitat loss. One adult female Guizhou snub-nosed monkey weighed about 8 kg (18 lb); two males averaged 14.5 kg. (32 lb). The Guizhou snub-nosed monkey is one of the species that live in the Mountains of Southwest China Biodiversity Hotspot (Cons. Intl.) . Young are born in the Spring. The Guizhou snub-nosed monkey is primarily arboreal, although it frequently crosses open areas on the ground. 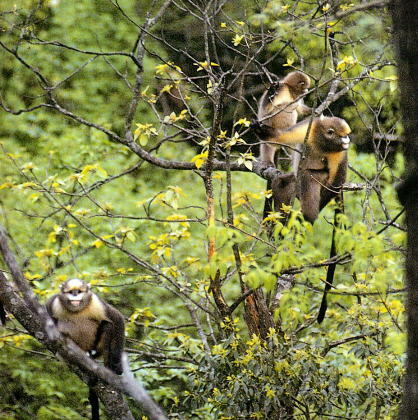 The social organization in the Guizhou snub-nosed monkey appears to be based on small groups of 3 - 10 individuals, each with a single male. These groups congregate in larger, semi-cohesive groups of up to 400 individuals. Bachelor groups of 2 - 5 adult or subadult males occur on the periphery of these larger groups.